Whenever I watch Sarge, Ash, and Baldy waddle past me, I grin. 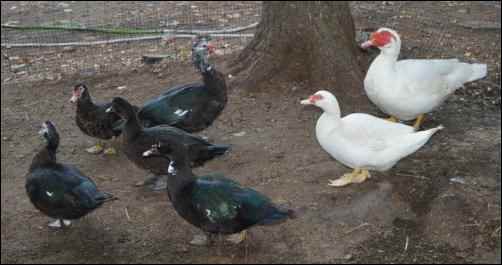 Those three Muscovy ducks are the reason my partner Larry and I went beyond just a one-time thing of raising a batch of meat ducks, onto something even I could not imagine. I remember the day I read an article about Muscovies in a homesteading magazine. 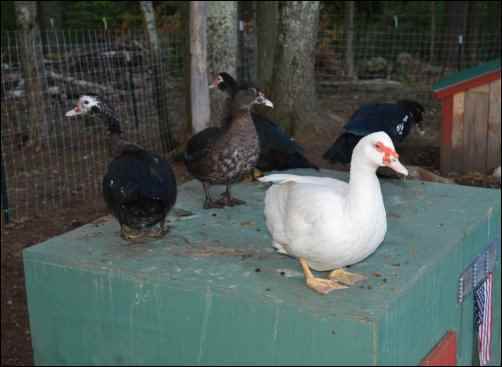 The picture of an adult all-white Muscovy drake was what caught my eye. I thought it was a goose; I had never seen such a huge duck! His bright red mask (caruncles) was odd, but cute to me. That article fueled an online search for more information on the birds. 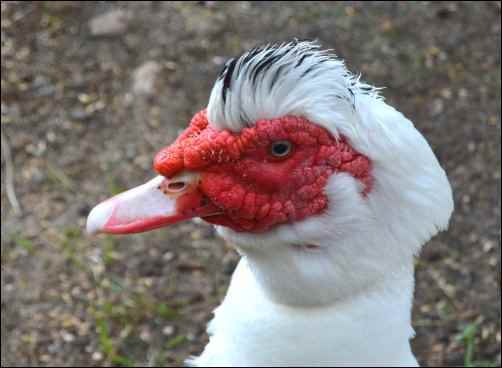 I had been curious about meat ducks in general, but the more I read about Muscovies, the more I wanted that breed. When I learned that they were quiet and low maintenance, I was hooked. I was already researching mellower chicken breeds, on my quest for a quieter farm. Muscovies could be the first step to lowering the volume on our homestead. During dinner one evening, I laid my idea on the table. I’m sure my eyes flashed, my cheeks flushed, and excitement oozed out of me as I explained how much I wanted meat ducks. Yet despite my winning smile, Larry didn’t look enthused. “You said it’s too noisy around here already. Ducks quack,” he commented. I smiled wider and explained that they were quackless. He looked skeptical. “Muscovies are one of the best meat ducks,” I explained. I went into butchering size, and that they were supposed to be the best tasting. He stared some more while he chewed. “Have you ever had it?” he asked. When it comes to animal husbandry decisions, Larry is the opposite of me. He is practical. He takes his time processing new information. Researches the realities of cost, housing, feed, etc. He was good at all that. I was good at wanting more animals. I sent him the internet links I had bookmarked about Muscovies, and went about our daily life. After all, we had already maxed the poultry budget for the year. We had bought the ton of feed, and built the housing for our current and upcoming birds. He was the one who would have to build the additional housing for ducks, and would have to figure a way to budget in more feed, bedding, etc. He needed time to figure it out. I had to wait. Not long after presenting the duck idea (thankfully, because I’m terrible at waiting), he gave me the green light. The farm we order meat chickens from just so happened to raise Muscovies. I think that made this new venture more comfortable for him. 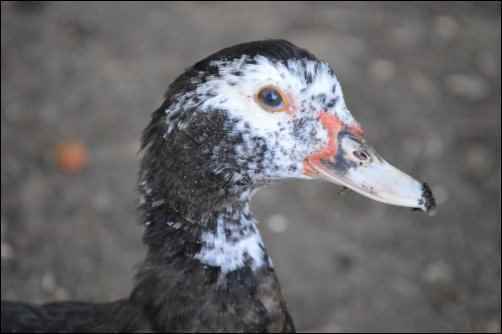 When sixteen white Muscovy ducks were ordered that February—due to arrive in a month—I was a happy woman. Having no clue what I was doing, the first purchase I thought I needed to make was a kiddie pool. Because ducks like to swim, right? 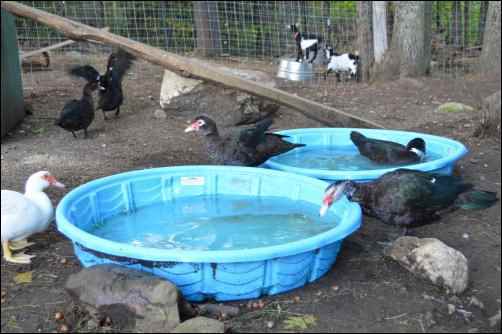 Then I re-read the part where Muscovies don’t really require a pool, and that it would be a while before they would use a pool anyway. Instead of setting up a pool, I got the proper equipment gathered. Our sixteen white Muscovies arrived at the post office on March 9th. A day later than we expected. There was a delay at one of the post offices, and the ducklings missed their flight. It was frigid in New England that week and we were concerned about the babies. When the post office called us at 5:30 a.m., we were ready. A peek into the post office box was met with the sweetest little babies gazing up at us. It was hard to tell if they were okay, but they were alive. I reached in and felt their wee webbed feet. Some were cool the touch, while others were downright cold. They were not loud and chirpy like chicks; they were quiet. I didn’t know if that was normal. We cranked the heat in the truck and zoomed home. The truck barely stopped before my seatbelt was off. I hurried inside with the big box. I was excited, but still worried. One by one, despite our efforts to revive the ducklings, within 24 hours, we lost half. The hatchery was sorry for our loss, and reimbursed us the cost of eight ducklings. Our first experience with shipped ducklings was not what I expected. Some days on a farm can be a rollercoaster ride; that day was one of those days. We said goodbye to the ducklings that left us, and said hello to the ones that stayed. I was grateful that we still had eight. Once I saw that those eight were healthy and strong, I dove into caring for our new additions with more excitement. Here, I am breaking up the raising of our meat Muscovies in stages. As they grew, I changed their food and environment to meet their needs. The brooder (a galvanized-metal stock-tank) was moved to the extra room days before the ducklings’ scheduled shipping date to insure the metal was room temperature. A one-inch layer of pine shavings was added. A layer of blue, shop paper-towels was placed on top of them (easier for clean up, and for new babies to walk on). Blue paper-towels were removed after a few days. I got to buy a kiddie pool after a few days! Not for water though; it was used as a holding area/playpen for the ducklings while I cleaned out the brooder. This decision was made after a series of comical mishaps when I just let them waddle on the floor while I cleaned. I put a large, plastic pet-bowl in it (filled with water) for them to experiment, and gave them treats. There was a lot of duckling handling in the first month, as there was a lot of cleanup. I was good with that… Nothing beats holding a chubby duckling. We used non-medicated poultry starter feed (20% protein) in 20-inch-long plastic feeder that had 28 feeding holes (14 on each side). A 30-egg (carton) flat can also be used, although I find that the food stays cleaner with plastic feeders. Treats were introduced at two weeks. A variety was offered: green vegetables, lettuces, scrambled eggs, meal worms, fruit… Most of it went untouched, except for the lettuces and scrambled eggs. They went gaga for those. I limited treats for one reason: their poop became super watery. Eight ducklings with runny poop in a brooder was not fun. I didn’t mind our daily clean-up/playpen time, but when it became a twice-a-day thing, I decided to hold off on food variety until they moved outside. We added Broiler Booster to the two chick waterers. It is a water-soluble vitamin/mineral/electrolyte powder we use for all meat chickens and turkeys. I had puzzled over which waterer to use for ducklings, thinking they needed a special duck waterer. It turned out that their bills were so small, chick waterers worked fine. The babies were huge at one month; much bigger than I anticipated. Work schedules did not allow a rush build on our planned duck-house (complete with attached run), so in the meantime, we transported them to the fenced (dormant) herb-garden during the day, and housed them in the “turkey shed” at night. The “turkey shed” was what my man had used in previous years to raise meat turkeys. It had a 10×10 kennel attached. Not my dream duck-house, but the babies would be warm and safe. It was cleaned thoroughly, and a four-inch layer of fresh sand was shoveled into both the run and sleeping quarters. While they played in the herb garden, I filled two (new from the dollar store) kitty-litter pans with water for them to play in. They were as thrilled as I was at being outside. I couldn’t keep my eyes of them as I went about daily chores. They were the friendliest, mellowest birds I had ever cared for. I had taken a liking to three in particular: a drake and two hens. I remember wishing I could keep them. 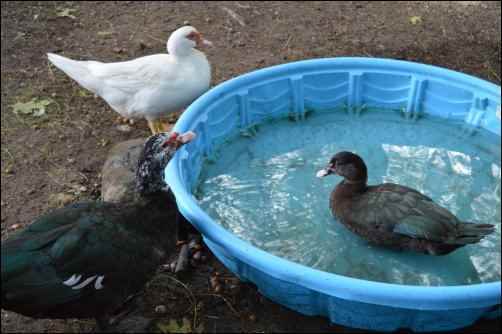 But the goal of this endeavor was to raise a batch of meat ducks. So, something happened while raising these ducks. I fell in love with them more each day. Larry could not argue. He liked having them around as well. Because of this, Larry built the duck house we planned. We pulled the drake and the two hens I liked out of the meat pen, and decided to keep them. We would keep these as pets, and see if they could make offspring we could use for meat, (despite mixed information whether hatchery ducks would reproduce). Still though, after all this work, we would have only five meat-ducks in the freezer this year. What made the decision to keep them easier was a visit to the feed store. It was there I saw a flyer tacked up. Muscovy ducklings for sale. $5 each. Seriously, that was less than half of what we paid for the French white ones. Phone call made, a half-hour drive later, and we had three more ducklings to fatten up. They were brown and yellow, and tiny! We wanted more, but that’s all the woman could catch in her pond from the batch just hatched. There was a six-week age-difference with the other ducks. Now I had to care for newborns, a pen of meat ducks, and the duck house with the three keepers. Larry shook his head, but since I didn’t complain, and caring for them was up to me, he didn’t say a word. Meat ducks: I began adding meat-bird crumble to the starter food. After a few days, they were on straight 22% meat-bird crumbles. Broiler booster was continued in the water (now a five-gallon waterer). A large assortment of veggie scraps. grains, and leftovers were offered daily. Note: At around the ten-week mark, the largest drake (huge fella!) became sluggish. When he attempted to walk, his thick legs trembled, and he would sit after a few steps. I researched this, and decided to add niacin to the water. I also sprinkled some on their food. Within a few days, he perked up, and the tremors diminished. Broiler booster was continued in their water. Keeper ducks: They continued with the non-medicated starter crumble. A sampling of veggies and greens was offered daily. Their main diet was starter crumble. Broiler booster was continued in the water. Ducklings: Same non-medicated crumble as previous batch. Meat ducks: Shed with kennel run attached. Keeper ducks: New duck-house. Our chickens visited them in their run regularly, and the dog was introduced to them on a supervised basis. The ducks got along with everyone. Ducklings: Stock-tank brooder in house. The three wild-type ducklings joined the white keeper-ducks (in a 36-inch rabbit cage). From day one, the newer ducklings did not like to be handled. Regardless of what I did, they were terrified of human contact. I do not know if it was because they came from a wilder stock. I do know that despite my (attempts at) handling, moving to the pool for cleanings, filling food and water, offering treats, etc., they tried to run and hide. I continued feeding the keeper ducks and ducklings starter crumble, and giving the white ones more yard freedom. It was when I introduced the ducklings to them, supervised in the fenced-in run, that I saw aggression in one of the white females. At first, I thought her pinning down and nibbling was “normal” duck behavior. The other two did this a little at first, but then stopped, pretty much ignoring them. If I was right there, she would get shooed away when too rough, but her eye was always on them. If I let them in the run, and backed off a safe distance to observe, she attacked them. I waited a week for her to knock it off… she never knocked it off. On the eve of butchering day, she was placed in the meat pen, and exchanged for a runt female (Baldy). The other female (Ash), and the drake (Sarge), accepted her without a hitch. The three of them got along great with the ducklings. Just like that, there was peace in the duck house. Meat ducks: Butchering day was chosen. Ten bags of ice cubes were made, bagged, and stored (2 lb. bags). Night before: Canopy, killing-cone stand, processing table, knives, stainless steel bowls, homemade drum-style plucker (my guy built it), aprons, gloves, hose, and trash barrels (five-gallon buckets) with bags were set up in the desired processing spot. With just the two of us, and in a calm manner, the ducks were killed, plucked, and butchered. Ice was placed inside their carcasses, and all five birds were placed in an iced-filled cooler overnight. The following day, four of the ducks were bagged in freezer bags and stored. The remaining duck was roasted. Much to my relief, it was one of the most delicious meals I ever had. Larry agreed. The breast tasted like rare roast beef, or veal. Keeper ducks: Ash, Baldy, and Sarges’ story, along with the wild-type duckling trio, and a future wild-type duckling foursome is a story of its own. 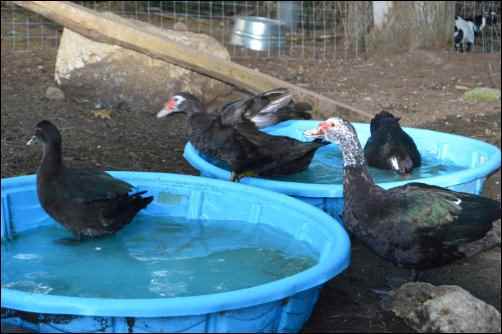 It is a story of how to care for and raise breeder Muscovies, for meat and pleasure. I will say that yes, hatchery white-Muscovies can breed, lay eggs, and hatch babies. The wild-type Muscovies we acquired were never as physically friendly as our whites, but all of them have unique qualities and personalities. They, too, can breed and hatch babies. Not all of them though—two ended up in the freezer. I found out that you can only have so many drakes in your duck world. What I learned from my first year of Muscovies, applies to farm life in general: things do not always go as planned. And while we did not get the sixteen meat ducks in our freezers we originally intended, we did get five. We also secured a flock of breeder ducks, who will we hope will continue to provide us an ongoing supply of meat, as well as an ongoing supply of entertainment and pleasure. I am proud to say that I am mad about Muscovies. I believe that anyone who has the pleasure of living with these amazing creatures, will be mad about them as well.